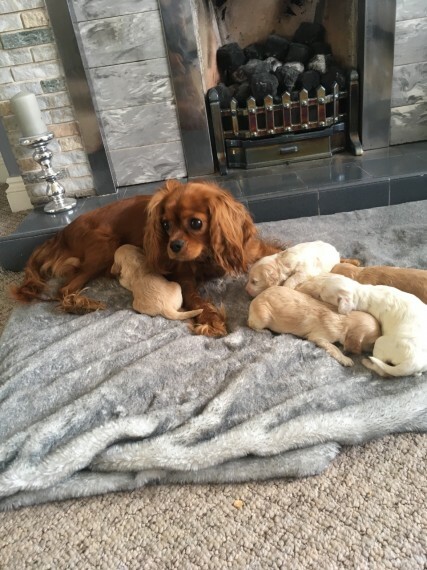 Our beautiful King Charles cavalier ..beau.. has had a mixed litter of 2x girls and 4x boy cavapoos. A mixture of champagne and white and champagne. Both mum and pups are doing brilliantly. This is beaus first litter. She was mated with a white toy poodle named Casper who is PRA clear. Pups have been brought up into our family environment and are handled every day with me and my children. Also used to other pets being around and household noises. Pups will be vet checked. microchipped. first vaccines. fleed and wormed before they leave to their new homes. Feel free to ask me any questions. 150 deposit secures pup.